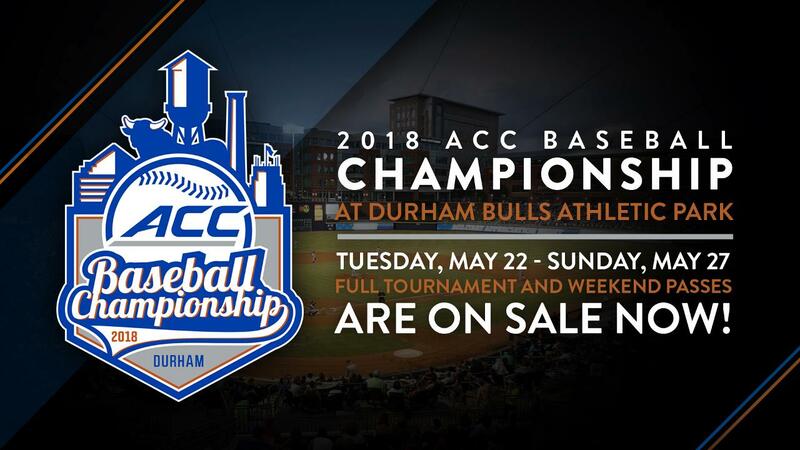 Single-game tickets, full tournament packages and weekend packages for the 2018 Atlantic Coast Conference Baseball Championship, scheduled for May 22-27 at Durham Bulls Athletic Park, are now on sale.Ticket books for the full tournament are available for $150, which includes tickets to all 15 tournament games, including the championship on Sunday. Also available is a weekend package for $45, which includes both semifinals on Saturday and Sunday's championship. Full tournament packages are available by clicking here, and the weekend packages are available by clicking here. Additionally, orders can be taken by phone at 919.956.BULL (2855), ext.3. The 2018 ACC Baseball Championship will be the event's second year under a new format, featuring 12 teams in a pool play format leading into a four-team, single-elimination bracket to determine the league champion. The ACC Baseball Championship annually features many of the nation's top teams and best players. The ACC has had at least seven teams earn bids to the NCAA Championship in each of the last nine years and has had at least one team in the College World Series for 12 consecutive seasons. Last year, the ACC led all conferences with 20 All-Americans and had 75 players selected in the 2017 MLB Draft. The ACC Baseball Championship has been held in Durham 10 times previously, including five of the past nine years. ACC Baseball Championship attendance records for a single game (11,329 in 2013) and a title game (9,759 in 2015) have both been set in Durham.